The Savannah River Site (SRS) is a 310-square mile (803 square kilometer) site that is owned and operated by the DOE. The site is in South Carolina, southeast of Augusta, Georgia. The site was built during the 1950s to produce the basic materials used in the fabrication of nuclear weapons, primarily tritium and plutonium-239. Currently, a major focus at SRS is remediation activities associated with the production of these materials. The F-Area Hazardous Waste Management Facility at SRS consisted of three unlined, earthen surface impoundments called “seepage basins.” From 1955 through 1988, the F-Area seepage basins (FASB) received approximately 1.8 billion gallons (7.1 billion liters) of low-level waste solutions originating from the processing of uranium slugs and irradiated fuel in the F-Area Separations Facility (Figure 57). The effluents were acidic (wastewater with nitric acid) and low activity waste solutions containing a variety of radionuclides and dissolved metals (Killian et al. 1987). After entering the basin, some wastewater evaporated, and the rest seeped into the underlying soil and layered Coastal Plain sediments. When the FASB were constructed, the conventional belief was that most of the radionuclides would be bound in the soils beneath the basins and would not pollute groundwater. Though the seepage basins functioned as designed, the acidic basin influent mobilized some metals and radionuclides, resulting in groundwater contaminant plumes. Many radionuclides migrated to the groundwater, including: plutonium isotopes, cesium-137 (Cs-137), strontium-90 (Sr-90), uranium isotopes, iodine-129 (I-129), technetium-99 (Tc-99), and tritium. Currently, the main risk drivers for the groundwater are Sr-90, uranium isotopes, I-129, Tc-99, tritium, and nitrate (Denham and Vangelas 2008). The pH of the groundwater within the plume is as low as 3.2 near the basins and increases to the background pH of 5.5–6 at the plume fringes and upgradient of the basins. 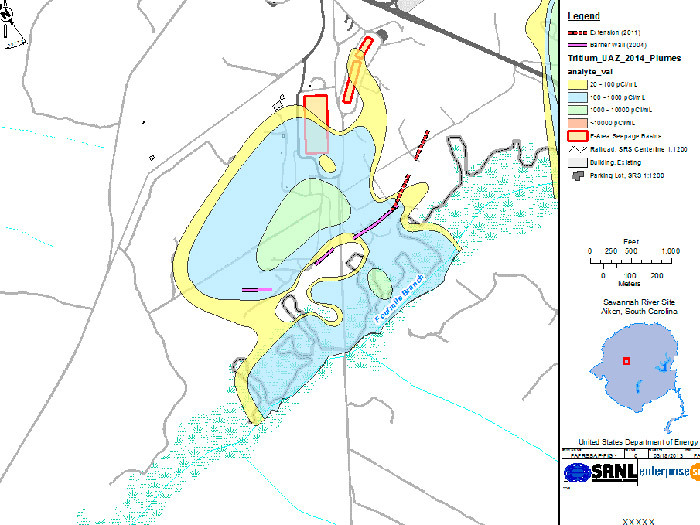 Figure 58 shows the distribution of tritium in 2014 in relation to seepage basins, funnel and gate treatment system, seepline, and receiving stream. The geochemical complexity of both the impacted zone and comingled plume constituents provide the greatest challenges to efficient and effective remediation activities. The strong acidity of the affected groundwater contributes significantly to increased mobility of metals and radionuclides. The diversity of the comingled radiologic, cationic, and anionic species in the plume requires multiple remedial strategies to address the full range of contaminants. Figure 57. 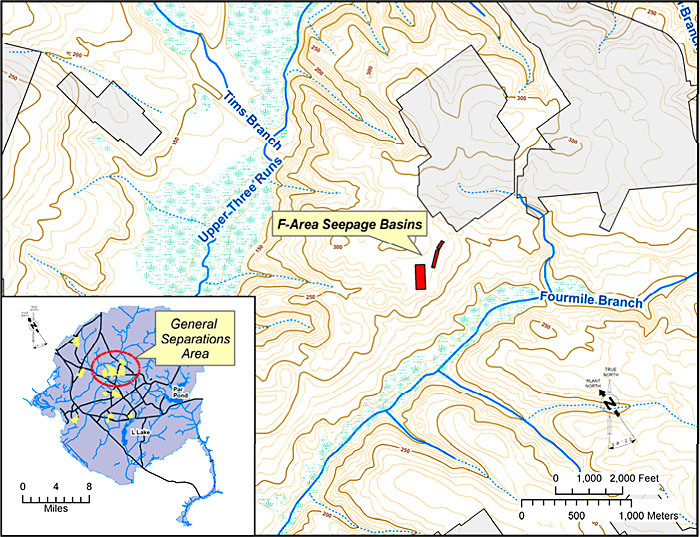 Location of the F-Area Seepage Basins at the Savannah River Site (Millings et al. 2013). Figure 58. Distribution of tritium in 2014 in relation to seepage basins, funnel and gate treatment system, seepline, and receiving stream (SRNL 2017). Over seventy site investigations have been conducted near the basins since the 1960s. Groundwater monitoring at the basins began in the late-1950s and has continued since that time. Over the years, various types and numbers of wells, seepline monitoring points, and surface water locations have been used for assessing impacts and remedial efforts associated with the FASB. The geology of the site is heterogeneous, consisting of poorly consolidated quartz sands and clays that are typical of coastal plain deposits (Figure 59). The plume is stratified within the water-table aquifer, moving mostly within a highly transmissive unit along the top of a clay layer that confines the aquifer below and cropping out at the seepline along Fourmile Branch (a stream approximately 1,600 feet downgradient from the basins). The groundwater remains acidic, with pH as low as 3.2 near the basins and increasing to a pH of approximately 5 downgradient. Figure 59. 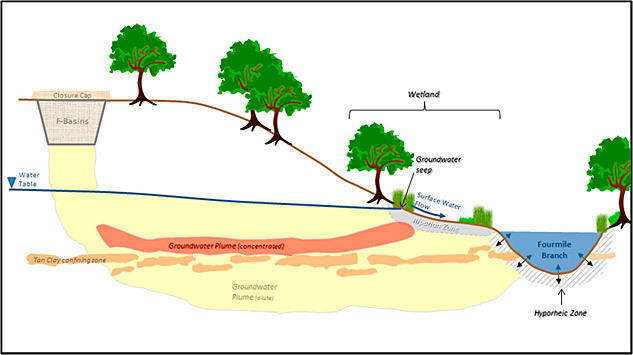 Schematic cross section of F- area groundwater plume (Eddy-Dilek, Kostelnik, and Denham 2016). As early as 1962, some contaminants had migrated to groundwater from the basins. Later, visual signs of vegetative stress suggested the plume had reached the seepline, which sampling later confirmed. Extensive sampling and monitoring were completed to delineate the plume, which had a footprint of approximately 0.38 square mile. In 1986, it was determined that the basins should be regulated under RCRA as hazardous waste disposal facilities, and closure plans were initiated. The Natural Resources Defense Council sued the Savannah River Site in 1988, which accelerated treatment of this waste unit and associated groundwater under RCRA. The RCRA permit issued in 1992 specifies the regulatory requirements for the groundwater corrective action program, as well as other appropriate local, state, and federal laws and regulations. The corrective action plan specifies a phased remediation approach to implement the basic remedial system, followed by evaluation the effectiveness of corrective action design and system components. This evaluation is used to design and implement additional corrective action elements, as necessary. The corrective assessment plan goals account for technical impracticability and economic feasibility considerations. The basins were closed in 1991 by dewatering, physically and chemically stabilizing the remaining sludge, and covering them with a protective multilayer system to reduce rainwater infiltration. In 1997, SRS designed and installed a pump-treat-and-reinjection system with a water treatment unit that trapped the untreatable tritium in a continuous loop. This system extracted downgradient groundwater, removed contaminants other than tritium, and then reinjected the treated water upgradient of the seepage basins. The treatment system consisted of precipitation/flocculation, reverse osmosis, and ion exchange. Operation of the water treatment unit began in 1999 and was continued until 2003.The system operated as designed, but had two significant drawbacks: high cost and large amounts of radioactive solid waste as a byproduct. SRS sought another, more efficient way to treat the groundwater contaminant plume. In 2004, the P&T system was replaced by a hybrid funnel-and-gate system that was installed about 1,000 feet upgradient from Fourmile Branch. The purpose of the funnel-and-gate is to slow migration of contaminated groundwater and to funnel it through in situ treatment zones at the gates. Extensive geologic characterization showed that much of the plume migrated along “troughs” at the top of the clay layer that confines the lower aquifer. 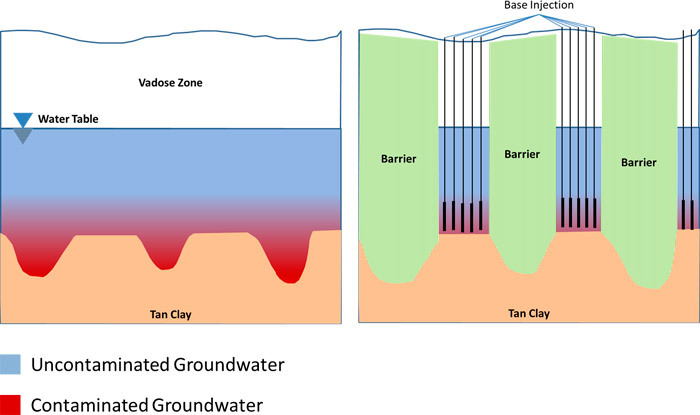 The walls (or engineered subsurface barriers) were installed across these features to slow contaminant migration and force it through the gates (Figure 60). The treatment zones at the gates attenuate migration of uranium, Sr-90, and I-129 by sorption or precipitation. Tritium migration is slowed by the walls and additional decrease in tritium concentrations is achieved when the stratified plume mixes with less contaminated groundwater as it migrates up through the gates. Figure 60. Cross-sectional conceptual model of funnel-and-gate with base injection system before (left) and after installation (Eddy-Dilek, Kostelnik, and Denham 2016). Treatment zones for uranium and Sr-90 at the gates are maintained by neutralizing acidity of the groundwater and mineral surfaces with injections of an alkaline solution. This treatment causes sorption of the contaminants and precipitation of uranium phases. Periodic injections are performed, with the frequency at each gate dictated by sentry monitoring wells located downgradient. Monitoring of the performance of the funnel-and-gate with base injection over the past seven years indicates that it has functioned as planned. Analysis of subsurface cores collected downgradient of the middle gate shows that an elevated pH treatment zone has been established. Groundwater monitoring indicates that tritium flux has been reduced to interim objectives and regulatory limits on concentrations of Sr-90 and uranium have been achieved downgradient of the treatment system. In 2009, a pilot study evaluated the removal of I-129 by the injection of particles of solid silver chloride. Contaminant I-129 and natural iodine-127 react with the silver chloride to form insoluble silver iodide, thus removing I-129 from the groundwater. In 2011, the RCRA permit was modified to deploy silver chloride technology at the middle gate as part of the corrective action. The treatment zone extended from the top of the water table down to a local clay layer (25 to 50 feet below ground surface). Injection was performed starting at the bottom of the aquifer and proceeded upward pumping a specific volume of amendment into each zone at 2.5-foot intervals. Evaluation of the performance of the silver chloride treatment zones continues. Implementation of long-lived, attenuation-based remedies such as the funnel-and-gate system at the FASB will require adequate levels of monitoring to ensure that the remedies continue to be effective over long time frames. This monitoring will be required to demonstrate to regulators and stakeholders that attenuated contaminants are behaving as predicted by site conceptual model and that they will not remobilize. In 2014, a pilot field test was initiated to test an alternative approach for long-term monitoring that should simultaneously improve the monitoring systems and lower costs. The new approach measures the controlling variables that are leading indicators for changes in the stability of the plume; these indicators would be supplemented by a substantially reduced number of well measurements. The controlling variables include boundary conditions, master variables, and plume/contaminant variables. Boundary conditions control plume movement and therefore indicate changes in plume stability. Master variables are the key variables that control the chemistry of the groundwater system, and include redox variables (ORP, DO, chemicals), pH, specific conductivity, biological community (breakdown/decay products), and temperature. A robust suite of tools is commercially available to measure these variables. Concentration measurements for all types of contaminants in groundwater are a lagging indicator plume movement—significant changes indicate that contamination has already migrated. The new paradigm relies on leading indicators, which alert site managers that conditions at the site are changing in ways that could lead to plume expansion. An effective Core Team is essential. Clear, concise, and accurate problem definitions are critical. Early identification of likely remedial actions is possible, prudent, and necessary. Uncertainties are inherent and will always need to be managed. The Core Team process enhances communication and productivity to streamline the decision process and facilitates remediation problem solving at an early stage. Thus, SRS has built a highly productive working relationship not only with its regulators but also with other public stakeholders such as the SRS Citizens Advisory Board (CAB). Once a waste unit has been fully characterized, remediation alternatives evaluated, and a preferred method proposed, SRS solicits comments from the public, which includes representatives from the media, legislators, educators, and other citizens. During the public comment period, SRS also seeks comments from the CAB. The CAB is an appointed advisory group of citizens that makes recommendations to the DOE, USEPA Region 4, and SCDHEC regarding SRS remediation. Once comments are received from stakeholders and considered, a ROD is issued that documents the selected remedial alternative. DOE gives regular briefings to the CAB committees on remediation projects that are in progress, upcoming remedial decisions, and the programmatic and upcoming actions or administrative matters under the FFA and RCRA permits.